On January 2, 2017 a joint team of the Wildlife Conservation Society and Neophron Tours carried out the scheduled monitoring of waterfowl in the northern Bulgarian Black Sea lakes Durankulak and Shabla, traditionally hosting almost the whole population of the Red-breasted Goose in winter. 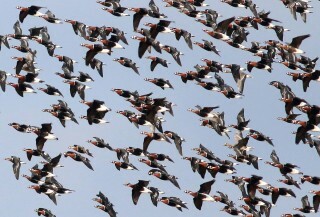 During the survey we established 6’390 Red-breasted Geese and 16’400 Greater White-fronted Geese. We also watched 90 Graylag geese in Durankulak Lake. Compared with the survey which we conducted on December 17, 2016 the number of wintering geese in Coastal Dobrudzha has grown considerably, although it is still far from the numbers that accumulate here in the last 20-25 years. 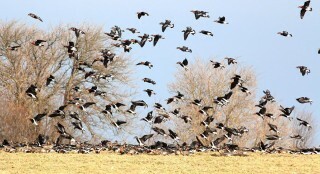 With the new cold spell coming this weekend, we expect even bigger numbers of geese at their traditional winter roosts. In Durankulak again we found a small flock of White-headed ducks (this time 7 birds) – an extremely rare duck, with alarmingly decreasing numbers worldwide.